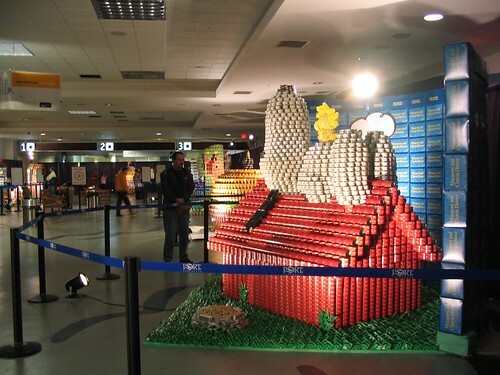 As has been mentioned here before, Canstruction is an annual contest and art show where teams gather to create sculptures completely out of non-perishable foods. The sculptures sit on display at Canada Place for a week and afterwards they are dismantled and the food is donated to the Greater Vancouver Food Bank. I think it’s a good event on several levels. It’s a great teambuilding activity, a free art exhibit and some of the results are pretty impressive. Not to mention, it provides local food banks with an influx of food in the middle of March, a time when donations tend to be pretty low. There’s still time to participate in this year’s competition. The deadline for teams to sign-up is next Friday, February 16. Sculptures from this year’s competition will be on display from March 4th to 11th. More information can be found on the Canstruction website. Photo: Snoopy @ Canstruction by annchou.